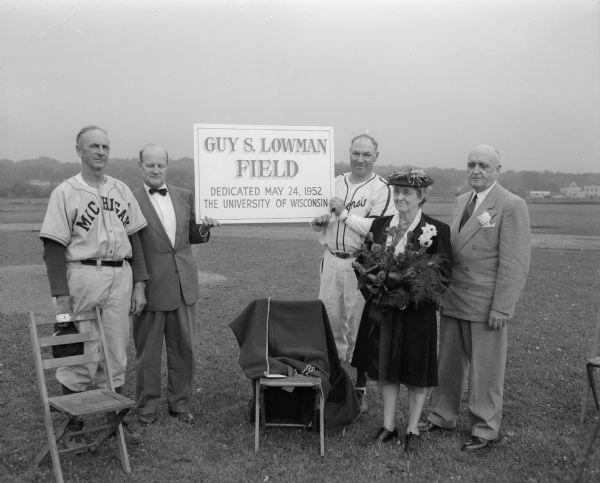 Ceremony dedicating the new baseball diamond to Guy S. Lowman who was the head coach in three sports at the University of Wisconsin at one time and was the head baseball coach for many years. Pictured, left to right, are Michigan coach Ray Fisher, Wisconsin Athletic Director Guy Sundt, Wisconsin coach Arthur Mansfield, Mrs. Lowman, and University of Wisconsin president Edwin B. Fred. Published in Wisconsin State Journal May 25, 1952.